J.P Morgan Chase is one of the world’s oldest and largest financial institutions with total global assets in excess of $2.6 trillion. The asset management arm of their business J.P Morgan Asset Management currently provides UK investors with access to 33 unit trust and OEIC funds. These funds combined hold almost £15 billion of client assets. As a truly global firm, their investment teams are spread across more than 15 cities around the world and are connected by investment hubs in London, New York, Tokyo and Hong Kong. Through their Global investment teams, J.P Morgan believe they have the expertise across every key investment class and every economic region to deliver and manage efficiently top quality investment funds for their clients. 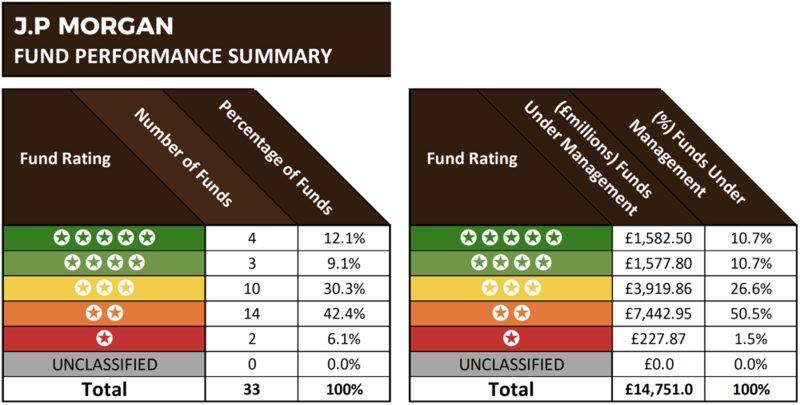 For this report, we analysed the 1, 3 & 5-year performance and sector ranking for 33 J.P Morgan funds and rated each fund’s performance from 1 – 5-stars based on how they consistently performed in comparison to all other competing funds within the same sectors. Our analysis identified that over the recent 1, 3 & 5-year period 4 JP Morgan funds received a top performing 5-star rating as each had consistently outperformed at least 75% of competing same sector funds over all periods analysed. 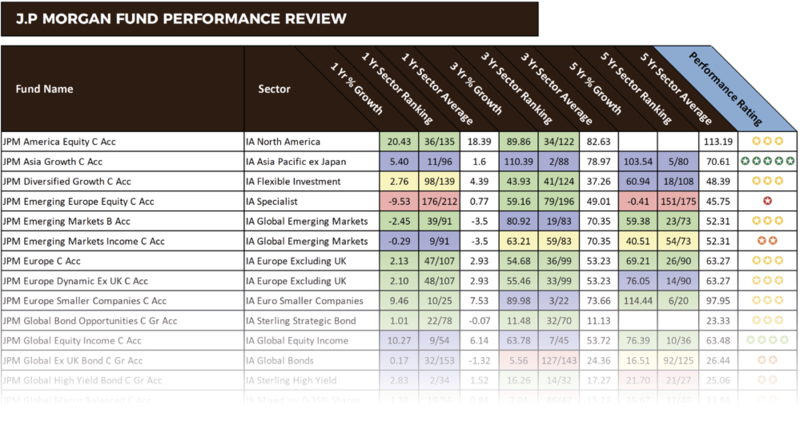 From their funds that received a 5-star performance rating, the largest was the JPM Japan fund. This fund is classified within the often volatile and higher risk IA Japan sector, and it invests primarily in shares of Japanese companies. Our analysis identified that over the recent 12 months the JPM Japan fund outperformed every other fund in the IA Japan sector with growth of 19.39% - In comparison, the sector average over the same period was 7.61%. Over the recent 5-year period it also excelled as it returned growth of 119.35%, which was notably higher than the 78.37% sector average for the same period. Another JP Morgan fund to consistently outperform its peers was the JPM UK Dynamic fund. This fund is 1 of 229 funds in the competitive IA UK All Companies sector with at least 5-years history. Over the recent 1, 3 & 5-year period it returned growth of 9.49%, 41.96%, and 62.58%, which was consistently better than the sector average of 6.87%, 36.88%, and 49.25% during the same period. The 33 JPM funds featured in this report hold combined client assets under management of £14.7 billion. However, the fund with the most substantial client assets was the JPM US Select fund, with £3.6 billion. This popular fund launched in October 2000, and it has consistently delivered returns that outperformed the sector average, however, despite its consistency, when compared to competing same sector funds it was outperformed by at least 29% during the periods analysed. To provide a performance comparison between a 3-star rated fund that has consistently maintained ‘good’ 2nd quartile performance to a 5-star fund within the same sector that has consistently maintained ‘top’ 1st quartile performance we analysed the JPM US Select fund alongside the Baillie Gifford American fund. Both of these funds share the same objectives (delivering growth by investing primarily in North American companies) However, the difference in their performance has been significant. Over the 1, 3 & 5-year periods analysed the JPM US Select fund has returned growth of 19.11%, 86.72%, and 125.06%, which ranked within the top 50% - 75% of funds in its sector. However, over the same time frame, the Baillie Gifford American fund returned growth of 44.86%, 151.39%, and 197.92%, which ranked consistently among the top quartile of funds within the same sector for performance. As identified in our analysis, JP Morgan have a robust selection of quality, 4 and 5-star rated, however, 16 of their 33 funds received a poor 1 or 2-star Yodelar performance rating. One of the most disappointing JPM funds was their UK Smaller Companies fund. Over the recent 5-year period this fund returned cumulative growth of 65%, which ranked 35th out of 44 funds in its sector and was well below the 93.68% sector average. However, despite its 3-year growth also falling below the sector average, during the recent 12 months this fund has delivered returns of 15.03%, which ranked a modest 13th out of 46 funds and was comfortably above the 11.96% sector average. Holding some £3.6 billion of client funds, the JPM US Equity Income fund is comfortably the largest of the 33 JP Morgan funds that we analysed. However, despite proving to be a popular choice for investors it has consistently delivered returns that were below the sector average and worse than at least 50% of all other funds in the same sector.